The brain processes information through a complex network of nerve cells called neurons. As we learn, groupings of neurons physically work together to accomplish learning or thinking tasks. Research shows that additional, nearby neurons are drawn into this process when the task is new or unfamiliar, or when the intensity of the learning demand is increased. Once the task is mastered, the borrowed neurons are released to go back to other duties; however, the gains in efficiency and processing speed required for that task are retained and make learning-related tasks easier. Neuroplasticity defines the brain’s ability to change and modify neuron activity and connections in reaction to increased learning demand. Gray matter can actually shrink or thicken, plus neural connections can be forged and refined or (conversely) weakened based on environmental activities that a person performs. One has the ability to take advantage of neuroplasticity by engaging in specially-designed exercises to promote rapid strengthening and growth of these neuronal connections. Cognitive abilities—such as memory, attention, sensory processing, and reasoning—can be increased with proper training. This increases immediate and future brain function, and produces more accurate recall, quicker processing, and easier learning across a wide range of learning challenges. The model below illustrates how learning takes place. 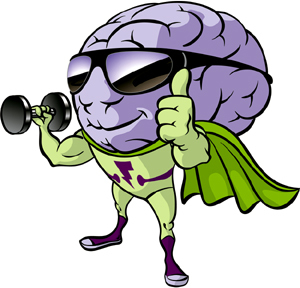 Brain training strengthens each of the “wheels” (cognitive skills) that make the learning process run smoothly. The key is being able to accurately identify and exercise the correct brain mechanism. 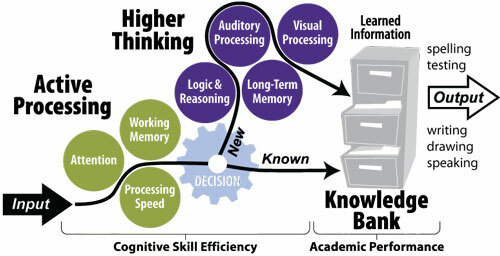 As the learning model above illustrates, information becomes knowledge through a path that relies on individual cognitive skills such as auditory and visual processing and memory. 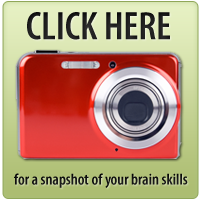 Different skill combinations are required by different learning challenges. If required skills are weak, learning (that is based on that particular skill) will be hindered. The power of brain training is found in its ability to identify through testing, target, and then strengthen individual cognitive skills. Individual training exercises build specific skill strength, and result in faster, easier learning. Research has shown that the brain never stops changing.